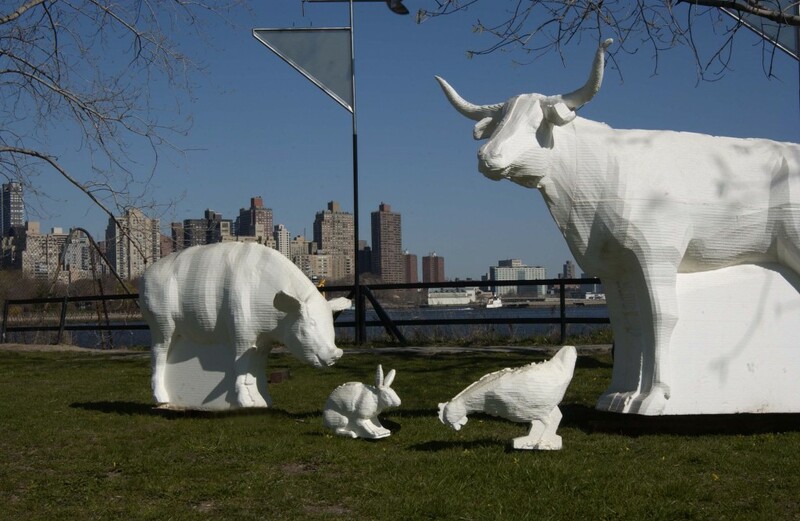 Socrates Sculpture Park is pleased to announce an Open Space project entitled Self-Sufficient Barnyard (The annual amount of livestock needed to feed a family of four) by Jon Conner. Self-Suffiicient Barnyard is an installation of 42 life-sized animals carved out of Styrofoam. Originally produced and shown at the Aldrich Museum of Contemporary Art in Ridgefield, CT, the installation includes 3 pigs, 3 sheep, 1 steer, 30 chickens, and 5 rabbits, all deliberately sculpted to resemble computer- generated animals. The colorless, 3-dimensional digitized forms are a high-tech reference to a life lived off the land. The juxtaposition of the automated construction and man-made materials to the organic forms they represent is an analogy for modern life and an indication of how far removed we are from our sources of sustanance. Jon Conner received a BFA in sculpture from Syracuse University School of the Arts, NY and an MFA from Columbia University School of the Arts, NY. His recent exhibitions include The Public Art Fund’s American Idyll at MetroTech Center, Brooklyn, NY (2003-2004); Faking Real (2003) and Mondo Cane II (2002), Leroy Neiman Gallery, Columbia University, NY; and the MFA Thesis Exhibition curated by Eungie Joo, The Mink Building, NY (2002). He lives and works in Brooklyn. This exhibition is made possible by the dedication and support of our volunteers, patrons and friends and by the generosity of: Altria Group, Inc., Milton and Sally Avery Arts Foundation, Carnegie Corporation of New York, Mark di Suvero, The Horace W. Goldsmith Foundation, JPMorgan Chase, Richard and Ronay Menschel, , National Endowment for the Arts, New York State Council on the Arts. Socrates Sculpture Park is grateful for the support of the City of New York, Mayor Michael R. Bloomberg, Queens Borough President Helen M. Marshall, City Council Speaker A. Gifford Miller, Assemblywoman Catherine Nolan, Councilmember Eric Gioia, and the Department of Parks & Recreation, Commissioner Adrian Benepe. Special thanks to The Aldrich Museum Contemporary Art Museum, Ridgefield, CT.
Socrates Sculpture Park is grateful for the generous contributions made by: Harold H. Anthony, Inc., Long Island General Supply, and Spacetime C.C.